Come get out of Ann Arbor and see a LEED-targeted project in another part of our chapter's region! In an attempt to hold events in other parts of our region, AIA Huron Valley is presenting a hard hat tour of the Jackson Innovation Center, an adaptive reuse of an existing 3-story department store in downtown Jackson MI. 1. Adaptive reuse of an existing 3 story commercial building in downtown Jackson for use as a business incubator office space. 2. Repair and restoration of existing terra cotta facade. 3. Daylighting strategies to bring natural light into an older building. 4. 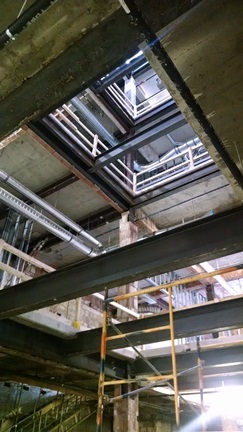 Structural and life-safety issues with a new atrium skylight that cuts through the roof and 3 levels of concrete floors to provide a light well through the building. 5. Coordinating construction for a multi-story building renovation with a tight timeframe. 6. Preservation of terra cotta cladding on building's existing steel structure. IMPORTANT NOTE: Attendees will need to have hard hat, boots, safety glasses, and hi-vis outer wear.